Your iPhone rings, but it’s not in reach. You’re using your iPad for work, so why not just answer the call on your iPad? Because it’s not a phone, of course. In your iPhone, go to the Settings app, tap FaceTime, and then set the iPhone Cellular Calls switch to On. 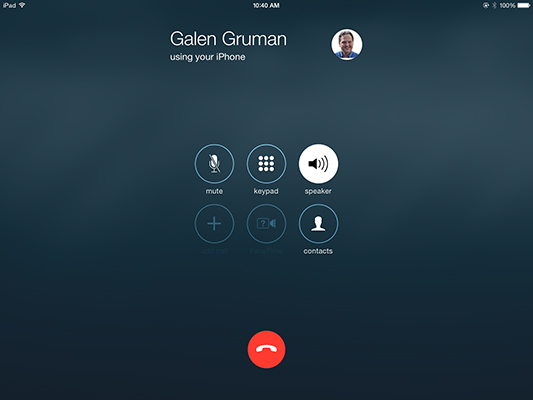 Now, your iPad will ring when your iPhone gets a call, showing a FaceTime alert. You can tap the Answer icon in the FaceTime alert to pick up the call. After a few seconds — there is a delay over Wi-Fi — your iPad is handling the call, which is routed through your iPhone. Tap End to end the call. Tap Audio to switch to the FaceTime Audio pane. Enter the phone number or person’s name in the field below the tabs. Tap the result from your entry; it could be a person’s name or the number you just entered, depending on what’s in your Contacts app. If you get a choice of numbers (such as if you entered a person’s name), tap the desired number. The iPad connects to your iPhone over Wi-Fi and uses it to place the call. You get the usual FaceTime audio controls on your iPad, as the figure shows, such as to use the speakerphone or end the call. Talk away — just remember that the quality may not be as good because you’re using Wi-Fi. Tap the End button when done to end the call.